With Ridley Scott in the direction and Di Caprio and Russell Crowe as main stars, this is one of the strongest American DVD releases of the year. Well, it seems that there is no director able to resist the charm of Di Caprio. Here again, the golden boy (well, ok, not a boy anymore) of the American cinema displays another great acting performance, very well backed up by an unusually fat and unattractive-looking Crowe. But undoubtedly, for me the nicest touch of the movie is Mark Strong as Hani Salaam, the chief of the secret services at Jordania. Although acting is good, the plot is weak. After watching it, I just found it predictable, one more movie in the American chain of movies dealing with Muslim terrorism that counts with The Kingdom or A Mighty Heart as latest examples of how to teach the Western spectator the difference between good and bad Arab citizens. Although the smart spectator can easily find layers of criticism to the American external policy here, it is still a deplorable collection of clichés, being not everything as black and white as Scott wants to portray here. The warfare tension of some other of his movies like Black Hawk Down is missing here, and checking how the American military technology works is something shown in every one of three releases during the last moths, so there is nothing surprising or shocking for the spectator. All in all, Body of Lies is not a bad movie, but maybe I start to feel a bit oversaturated with these kinds of products. I usually love Ridley Scott, but this is one got me disappointed. The worst: The portray of Muslims as the westerner´s enemies. 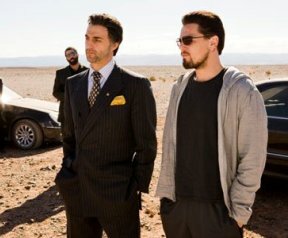 The detail: Many of the actors portrayed as Iraquis actually speak Arab with Moroccan accent all over the movie.